1. Put the banana chunks into a plastic container and freeze for 2 hours until frozen solid. 2. Add the frozen bananas, cocoa powder, honey and about half the coconut milk to a food processor. 3. Blend. Once the mixture becomes smooth add the rest of the coconut milk and blend again. 4. 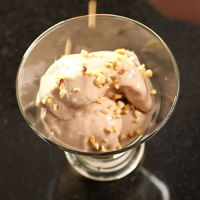 Serve the ice cream straight away with some roasted chopped hazelnuts sprinkled on top.